"I love the laptop bags, and have purchase them several times now. A local shop carries them and re-orders often!	" 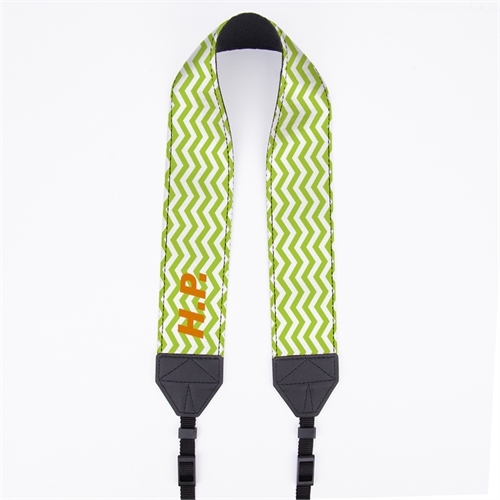 The Lime Green Chevron Personalized 2" Camera Strap helps to prevent your camera from falling and getting damaged when your taking photos on the move as well ast staying stylish. You can personalize the custom camera shoulder strap with a name, initials or your company name, making it unique to you or your company for a great promotional opportunity. The high quality material that we use to manufacture our custom camera straps provide a long lasting use and the leather material helps to make a better grip when the camera strap is around your neck or on your shoulders, so you camera does not swing around, preventing damage or a broken camera. We have no minimum and worldwide shipping.